Here you will find a variety of Classic College Trunks that are USA Made. DormCo has a variety of classic storage trunks in this section - you are sure to find something you love! From our classic collegiate footlocker with silver highlights that add to your dorm room decor to our dorm underbed storage trunk and college cork trunk, you are sure to find a dorm storage solution that will add plenty of value to your college dorm room. 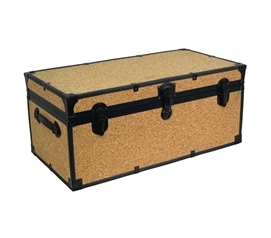 Our selection of storage trunks for college are durable and great to pack up for moving to and from college. Take a look around at our Classic dorm trunks and you will find a variety of colors and styles to suit your needs! You need a storage trunk for college to hold your college textbooks, cooking items, and other dorm essentials. That means you also need your dorm trunk to be durable. 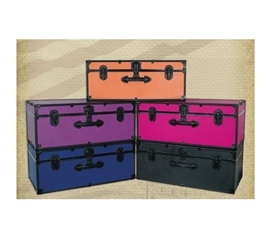 DormCo carries a variety of classic college trunks that are durable and will add to your dorm room decor. You can't get through college without extra dorm room storage. With durable dorm storage solutions like one of our Classic Dorm Trunk Styles, you are sure to find something you love that holds your extra seasonal clothes, dorm bedding and sports equipment!